Peppermint essential oil is one of the most versatile essential oils available. I carry my bottle with me everywhere I go. It's always in my purse when I am doing errands, working, traveling or at home. I run into so many instances where I can use and share this wonderful essential oil. Peppermint essential oil is incredibly powerful. Just one drop equals 28 cups of peppermint tea! Knowing this fact, you can appreciate how effective the oil can be when using it for the therapeutic applications listed below. Also, my suggestions below are for an AFNOR/ISO certified therapeutic grade peppermint essential oil, such as Young Living's essential oils. Any other grade of essential oil will not produce desired results. But as I always say, be sure to know the growing, distillation and packaging methods of your essential oil supplier before purchasing essential oils. Rub 1 or 2 drops on your stomach. Or, put one drop under your tongue or in a cup of water. It will relax the muscles of the stomach and intestines, helping you feel better, fast. Actually, this is how I got involved with essential oils. My friend gave me a couple of drops of peppermint oil to put on my stomach when I was feeling nauseous. Three minutes later my belly felt completely normal. I was sold! And have been an avid essential oil user ever since. Rub 3 drops of peppermint essential oil on the bottoms of your feet. It will penetrate the pores of your feet and enter your bloodstream within minutes, working to cool your body and lower your fever. This method for reducing fevers is especially beneficial in children. If your child is under 2, dilute the peppermint in an organic olive oil before applying it to their skin. I recommend diluting 1 drop of peppermint to 1 drop of organic olive oil. Dab small amounts of peppermint essential oil on your cheeks and forehead. Within seconds your congestion should begin to lessen and you should be able to breathe easier. Be very careful not to get it into your eyes! It will burn and make your eyes water! But if this happens, relieve the burning sensation by dabbing some organic olive oil in and around your eye. Olive oil is safe to use in your eyes to reduce the burning. Or you can just wait it out! The burning only lasts a minute or so. Use a smidge of peppermint essential oil on your tongue. You don't need much! It will kill the bad breath bacteria and make your breath smell minty-fresh! Using it as a breath freshener is a great replacement for chewing sugary gum or sucking on mints. Better for your teeth, too! Rub 1-2 drops of peppermint essential oil on the back of your neck. It will begin to produce a cooling and tingling sensation as it works to cool your core temperature. 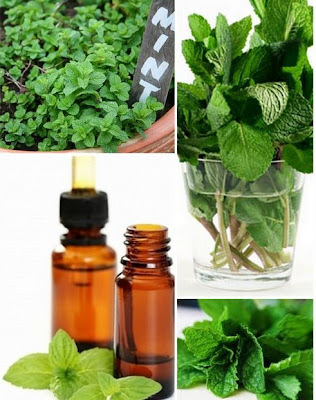 A great recipe for cooling off on a hot day is...1 drop of peppermint essential oil in 1 gallon of water. Shake well, pour over ice and enjoy! Fill a foot basin with warm water. Mix 1 cup of Epsom or Dead Sea salts with 3 drops of peppermint essential oil. Add the salt mixture to the foot bath and soak. The oil and salts will revitalize your aching feet by helping to decrease inflammation and swelling. If you get pedicures, you can bring this salt mixture and have your nail tech add it to your soaking water for a refreshing pedicure. Rub 1-3 drops of peppermint essential oil on your area of discomfort. For an added boost, apply heat, like a microwavable heating pack, to drive the oil in deeper. It has high anti-inflammatory properties. Rub 1 drop of peppermint essential oil on your temples whenever you feel scattered and unfocused. Studies have shown that diffusing it increases mental accuracy by 28%. I love to use it when I'm driving late at night. It helps keep me awake until I arrive home. I also use it for overcoming writers block. I'm wearing it as I write this article! Rub 1 drop of peppermint essential oil on your forehead and back of your neck. If you have nausea with your headaches, you can rub it on your belly and also a dab it on your tongue. It feels great on your skin when you have a headache. Lay a cool towel over the places you dabbed peppermint and the cooling sensation will intensify, bringing much needed relief. Inhale peppermint essential oil 5-10 times per day or whenever irrational hunger strikes you. You can even put a dab on your tongue to deter the cravings. I personally like to indulge my irrational cravings every once in a while, but try this tip if you're watching what you eat. Peppermint essential oil tackles many different ailments. It's one of the most versatile essential oils on the planet. Even though I've only listed my top ten list here, there are many, many more uses for peppermint. The next time you're experiencing one of these health challenges, reach for your bottle of peppermint essential oil. You won't be let down, I promise!